The OMG-USB-232-1 and OMG-USB-485-1 USB to serial I/O adaptors provide a single USB to RS-232 serial port (OMG-USB-232-1) or a single USB to RS-422/485/530 serial port (OMG-USB-485-1) providing USB connectivity to legacy or non-USB compliant devices. 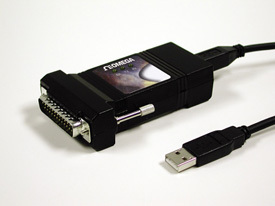 These adaptors support standard PC data rates up to 460K bps (OMG-USB-232-1) and 921K bps (OMG-USB-485-1). Simply install the included software and connect the adaptor to your USB port. The device is immediately recognized by the system. At that point, simply connect the adaptor to your target device (i.e. modem, serial printer, scale, bar code/mag stripe reader, etc.). Now your non-USB peripherals can have the same connection simplicity and ease of use as USB aware peripherals. We include our Windows 98/ME/2000/XP and Linux drivers to simplify installation. 참고: All OMG-USB-232-1 and OMG-USB-485-1 converters include utility software and a complete user’s manual on CD ROM and OMG-CA179 USB cable.